Some people visit every Major League Baseball stadium in one summer. Some hike deep into southern swamps in search of a woodpecker that’s probably extinct anyway. Some of us ride across country to hang out at a rally with thousands of other people who ride motorcycles that look like ours. We humans have an odd collection of things we’re passionate about, and the only thing in common is we all think those other people’s obsessions, or interests, are crazy. Unlike ours. The view from Spruce Knob, highest point in West Virginia. Photo by Lance Oliver. One such subgroup is called highpointers. They’re people whose hobby is visiting the highest points in all 50 states. While perusing maps and dreaming of a fall trip, it occurred to me that these high points would be places where I’d also tend to find curvy roads, dramatic topography, and sparse populations. 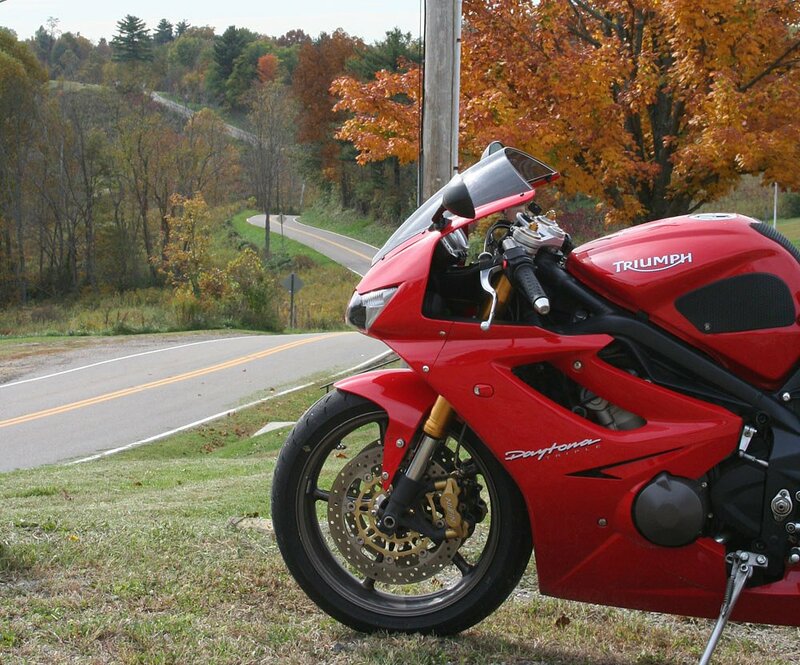 Not a bad recipe for a motorcycle ride. While most of the 50 high points are scattered, it’s easily doable to visit the highest peaks in Maryland, West Virginia and Pennsylvania in a single day. Paved roads even lead to two of them. I was sold. A chilly start to the morning. Photo by Lance Oliver. Then I was cold. I was shocked to find a little early season snow in the mountains along the Maryland-West Virginia border. Good time for a morning hike to warm up. To get to Backbone Mountain, the highest spot in Maryland at 3,360 feet, I have to park in West Virginia and hike in from out of state. Fortunately, it’s not as far as that sounds. Expense has been spared in marking Maryland's highest point. Photo by Lance Oliver. Some states make a big deal of their high points, turning them into attractions. Maryland barely acknowledges its. Spotting the small wooden sign nailed to a tree along U.S. 219 is not easy, and the trail up the mountainside is hard to follow, but at least the hike warms me. Pennsylvania’s Mount Davis is another story. A network of small roads climbs its flanks, past Amish farms with their distinctive, hand-lettered signs offering produce, eggs and baked goods for sale (“No Sun. Sales”) and dairy cows grazing on steep meadows. A series of turns brings me to a narrow lane that dead-ends at 3,213 feet. Oncoming traffic is not often a problem on Oak Dale Road on the flanks of Pennsylvania's Mount Davis. Photo by Lance Oliver. Pennsylvania has provided two amenities on Mount Davis: a rusty metal viewing tower, more than 50 feet tall and a steep climb, and a sign explaining that it’s just an optical illusion that those other rises nearby appear to be higher. I suspect state officials got tired of people pointing out their “mistake” and posted the sign to pre-empt complaints. Windmills whir above the S-curves of Route 42 near Mt. Storm, W.Va. Photo by Lance Oliver. 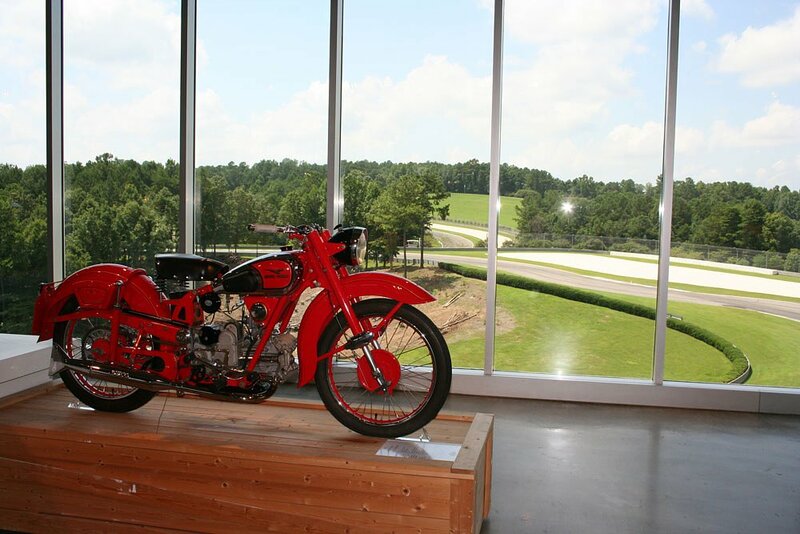 With the day warming up, the ride to the third high point is like the region’s motorcycling greatest hits. The series of S-curves plunging down the mountainside on Route 42 just south of the town of Mount Storm, W.Va., the hidden gem of a shortcut called Smoke Hole Road, the east-west ridge-crossing curves of U.S. 250 and U.S. 33 are just some of the samples. With the sun now shining brightly on the autumn leaves, the riding is about as good as it gets. A view along U.S. 250 in West Virginia. Photo by Lance Oliver. The road climbs to Spruce Knob. Photo by Lance Oliver. At Briery Gap Road, a sign points the way to Spruce Knob, West Virginia’s highest point at 4,861 feet. Several years ago, the state finished paving the road all the way to the top, though it’s still narrow and barely tamed. Not expecting me, a fox chooses an inopportune moment to cross the road. I brake, he shifts into a higher gear, and my front tire barely grazes the tip of his luxurious tail. Further on, I come nearly to a complete stop while two young deer standing in the roadway try to decide which way to run. A red-tailed hawk, intent on its hunt, swoops across the road ahead, just above helmet level. It’s clear the wildlife is used to having this back country to itself most of the time. Halfway up to Spruce Knob, it's worth stopping for the view. Photo by Lance Oliver. Unlike the other two states, West Virginia has spruced up Spruce Knob with a spacious, stone observation structure, a nature trail, and even a restroom. The silence is only interrupted by the sigh of wind through the needles of the trees that give the peak its name. The slanting sun illuminates dozens of variations of yellow, orange, brown and green on the hillsides below. It’s a high point, in more than one way. But I know I’m not truly a highpointer. Because for me, the high point is still the ride.